Millions of Android smartphone owners can now browse and shop online for apps instead of being restricted to only accessing the Android Market on their phone. Google's browser-based Android Market is now live after being announced at a press event at the company's Mountain View, Calif. campus this morning. The new Android Market allows you to browse, share, and download apps directly to your Android phone or tablet without having to snake a cord from your PC to your phone. I gave the site a quick spin and am impressed by how easy it is to find the app you're looking for or discover apps you might like, and then share them with friends. The store functions similarly to Apple iTunes, but there's a big difference: the Android Market is cloud-based so you can buy or download apps via your Web browser. Next, Google sends a message to your device of choice and bingo! - The app is installed. Apple, on the other hand, requires you to download the iTunes software to your PC. Unlike the mobile version of the Android Market, the browser store lets you refine your search options to show apps based on price, device compatibility, and popularity, helping you better find an app instead of digging through piles of irrelevant ones. When you find an app you want to download, you are taken to a page giving you more information about that particular app. Here you'll find user reviews, screenshots, and even videos related to the app. 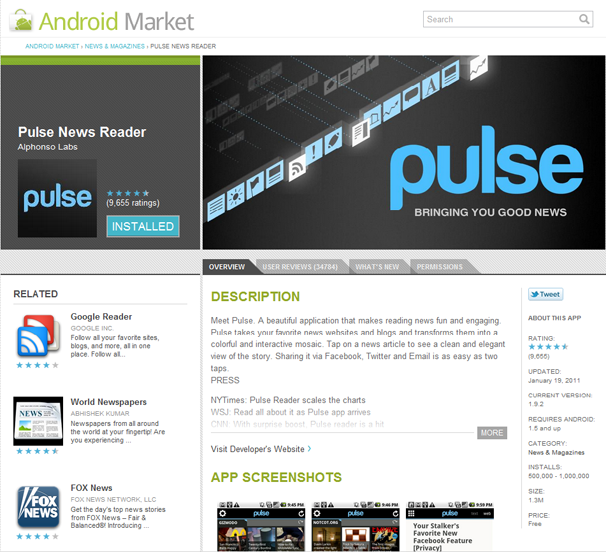 For example, when I searched for the Pulse News Reader app, I was presented with a page dedicated to the Pulse News Reader app which includes ratings, application size, price, as well as related applications. Essentially it is the same information you would get from browsing the Market on your phone only in a much nicer-looking package. Because your Android device is tied to your Google account, all you need to do is sign in to the browser store with the same account you use on your phone and you are set to go. There is no need to enter your phone model or number as Google already has that information. Once you sign in, just hit the big "Install" button of the app you wish to download. If you have never bought an app off of the Android Market place before, you will be asked to provide a valid credit card and billing information before downloading. Once you have that information down, you will be shown a screen asking you which device you would like to install the app on as well as the app permissions. After selecting your device and looking over the permissions, hitting "Install" one more time will send the app to your device. In my hands-on tests, the Pulse News Reader app installed in seconds. The website also allows you to look through past purchases and re-download them (in case you change phones). I downloaded the Pulse News Reader app to my HTC Droid Incredible running Android 2.2 (Froyo). Google doesn't list any system requirements, though I suspect that you'll need to have a device sporting Android 2.2 or higher in order to be able to download and install apps from the browser-based Market. If you want to share an app with your friends, you can tweet a link via a small Twitter button on the right side of every app page. Those on mobile devices can click on the link and it will directly open up to the app page in the Market. Those on PCs will be taken to the app's page on the browser-based Market. You currently cannot buy apps for friends like you can in iTunes, but you can buy an app once and install it on another device by going through your purchase history and re-downloading the app. 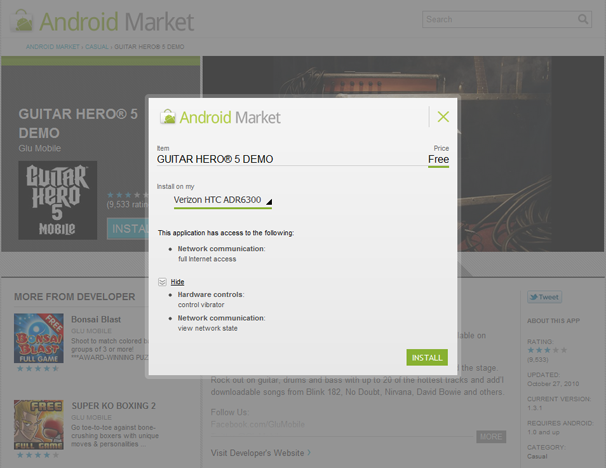 After my hands-on, I now prefer using the browser version of the the Android Market to the mobile version. I can find applications much faster and don't have to do all of my typing on a tiny keyboard. I also like that there isn't any extra software you have to download. Because your Gmail account is tied to the browser, you can pretty much find and download apps wherever you have an Internet connection. If Google could apply the same idea to a music service, Apple would definitely have some competition in the music market. The one thing that worries me about the Market being accessible on the web as opposed to just mobile devices is that it might become a bigger target for hackers and scammers. But overall, I think this is a step in the right direction for Android.